March is approaching. Do you need to let your hair down and have some fun? Are you a big kid at heart? You will be pleased to know that Perth’s many experiences offer a unique taste of excitement and fun, both in and around the city. 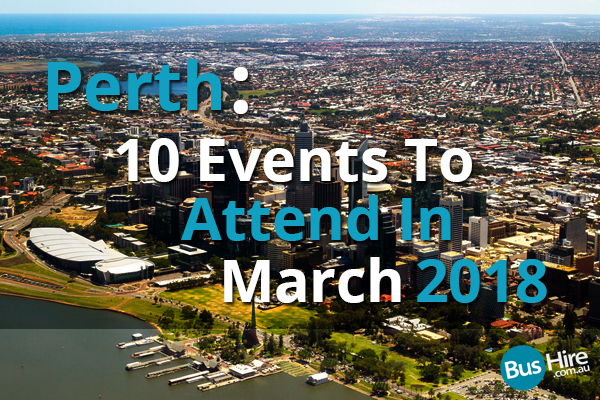 Choose Perth bus hire to travel safely and comfortably to these March event venues! Happening across various locations around Perth, the Perth International Arts Festival will last until 4th March. This a premier Western Australian cultural event. It features cutting-edge and joyousperformances as well as activities that are suitable for all ages. At the 2018 Festival, you will be able to experience some the world’s best contemporary and internationalliterature, visual arts, film, music, dance, and theatre. The wonderful display of talent and creativity will keep you entertained for hours. Some of the main event’s highlights include the Siren Song, a Noongar smoking ceremony, and more. Ed Sheeran returns to Australia and New Zealand to perform on a string of dates in 2018. The tickets for his 3rd March concert in Perth have already been up for sale since 16 May 2017. You’d better grab yours before they are sold out. Ed Sheeran is recognized as the first artist to headline Wembley Stadium without a band. Since his debut, his world tour concerts have always been received by the masses with overwhelming response. The Porongurup Wine Festival incepted in 1988. In 2018, the wine festival will be featuring nine outstanding local wineries. You will be able to attend wine masterclasses with Dan Wegener, check out cooking demonstrations, spectate a One Wok Wonder competition, and listen to live music. The participating wineries for this year’s festival include Mount Trio Vineyard, Montefalco Vineyards, Ironwood Estate, Castle Rock Estate, and more. Are you curious about how sand sculptures are built? On 9th March, SANDitecture is the event you want to attend. Held by Curtin Uni, you will witness in person fascinating and unusual objects being built out of sand. SANDitecture has become an annual affair for Curtin, and activities will be conducted around Alcoa Court for two weeks. One of the main highlights of the event is the works of Tim Darby. He is an extremely skilled sand sculptural artist and will be working on a giant sandy masterpiece. If you are into collecting antique and vintage collectibles, be sure to check out Retro Rewind 2018 on 10th March. Set in the beautiful Yanchep National Park, the retro market from 12 noon until 5pm. You will be able to browse through a great array of goods and wares that were available from the days gone by. There is also music from the toe-tapping era to enjoy. At the Vintage Collective Markets, over 60 retro stalls will be participating. As it is good food month, you will be able to sit down to a stunning dinner with legends from the food industry. The legends we are talking about are Marco Pierre White and Chef Neil Perry. The event is slated to happen at Crown Resorts’ Rockpool Bar & Grill, on 15th March. Coupled with the pairing of beautiful wines, you will definitely enjoy an unforgettable gastronomic experience. If you find the name Marco Pierre White familiar, it is because you have probably seen him on Masterchef Australia and Hells Kitchen. He is an internationally recognized chef and was the youngest among his peers to be awarded three Michelin stars. If you like the sport of fishing, do not miss out on GAMEX, which is Western Australia’s biggest fishing event. It is happening from 18th March to 24th March. This is also a stellar opportunity for you to take a short break with your family and loved ones away from the humdrum of everyday life. This WA’s No.1 fishing event is brought to you by the Exmouth Game Fishing Club. Caravanning and camping is the way to go when you want to explore more of WA or just spend more time in the great outdoors. RAC will be organizing a show that features over 400 caravans, 100 camper trailers, and a great array of tents that fit almost every budget. You will be able to find slide-ons, rooftop campers, motorhomes, and other camping equipment under the sun. If you need some travel advice, do not hesitate to raise your questions to the local tourism exhibitors. The event will be held from 21st March to 25th March. Toodyay Music Festival is a family friendly event that is being held on 24th March 2018. The event features live music performed by bands and buskers. Almost every style of music will be performed, including classical music, heavy metal, and more. In addition, you will get the chance to visit the picturesque town of Toodyay. You can also get your fill of grub via the variety of vendors. There is also music merchandise that can be purchased. The event will be featuring a full week of community living over Easter. As you might have guessed, Blazing Swan 2018 is based on the same concept of Burning Man. The latter is an annual gathering that was incepted in the United States. Blazing Swan was created as a yearly experiment, and its temporary community is dedicated to self-reliance and self-expression. Visitors who make the trip down to Blazing Swan are not only attendees. They are active participants that create the city and facilitate the diverse interactions that happen throughout their stay. In other words, they have a part to play in the whole experience. Art is a major component of the Blazing Swan experience. In addition, eventgoers also come up with their own theme camps, which are the interactive core of the popular event. Blazing Swan will be happening from 28th March to 3rd April.